Andrew = 8 / 10. An asbestos cleaning crew is put in charge of cleaning an abandoned mental hospital. Short on time, they decide to work day and night, but quickly strange phenomenons will create tension between them. 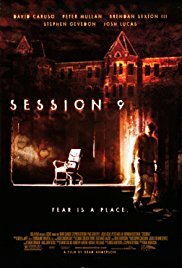 When talking about good psychological horror movie, Session 9 is one that always comes to my mind. The all atmosphere with the strange asylum, the dust everywhere and the dark tunnels makes the movie very oppressing. The characters and their relations with one another are deep and help creating a solid backbone for this complex psychological thriller. A few horror features have then been added here and there, a bit awkwardly sometimes, but overall the feel is the one of thriller. So yes, I would have liked a few more horror scenes to be honest, but still, this movie remains a very well-made one. It nevers gets boring and will keep you on-edge at all time.